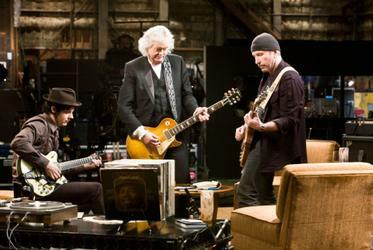 The Basics: Jimmy Page, The Edge and Jack White sit around and talk about guitars. Then they play guitars. Then director Davis Guggenheim (An Inconvenient Truth) gets the rock stars alone, one on one, to talk about their pasts and play some more guitar. Then the three reconvene--after baring their guitar-shaped souls to each other, the director, and you in the guitar-talk-hungry audience--and they play some more guitars. What's The Deal: You know how exciting rock and roll is? Here's the opposite of that, a really conventionally structured documentary that forgets that most musicians and artists are terrible at explaining who they are or why they do what they do. Sure, two of these guys are rock legends and the third fellow wants to be one someday (he's in his kooky-hat phase right now, which is one of the stations of that cross) but that doesn't mean you're going to learn anything about them you probably hadn't already guessed at before. Best Parts: Vintage footage of a very early U2 as they sorted out their look (funny clothes, puffy hair) and even older clips of a baby-faced, smiling, pre-occult Jimmy Page in '60s British "skiffle" bands. The lesson from these two bits are that the evidence should always be destroyed. The Elephant In The Room: In spite of Jack White's assertion at the beginning of the movie that the meeting could turn into a fistfight, there is zero discussion from The Edge about how the huge pop culture bloat created by bands like Led Zeppelin led to the backlash of punk rock. Nor is there any talk from Jack White about how monolithic entities like U2 were an anti-influence on the bands that came later. Instead it's all mutual yawn-inducing appreciation.